From 1908 to 1940, The Gideons International placed Bibles only in hotels and motels. Then one Gideon had an idea of creating a pocket-size New Testament, adding Proverbs and Psalms, and handing it out to members of the military. In January of 1941, the International Cabinet of The Gideons International approved the decision to supply the Armed Forces with copies of God’s Word. Acting wholly in faith, the Cabinet ordered 50,000 Testaments. In December, some of the first Service Testaments were distributed to members of the armed forces at Pearl Harbor. Who other than our Lord could have known at that time how perfect the timing of the distribution of these New Testaments was? On December 7th, Pearl Harbor was bombed. Over 2,000 people were killed, including 2008 from the Navy, 109 from the Marines and 228 from the Army. Plus over a thousand people were wounded. Today, working through military chaplains, Gideons ship hundreds of thousands of New Testaments to military installations all around the world. Within the United States, Gideons offer God’s Word to reserve forces and the National Guard as they train and mobilize. Gideons also present these New Testaments to military nurses and members of the National Guard and Reservists called out on active duty. A Gideon or military chaplain personally hands each New Testament to a soldier. To all of our members and donors, thank you for allowing God to use you to provide Scriptures to military men and women. And to those who serve in the military, thank you for protecting our country, our freedom and our right to worship our Lord and Savior, Jesus Christ. I am thankful on this Memorial Day weekend for those Cabinet members who were sensitive to God’s urging when they approved, on faith, this initial expenditure of funds. Many men and women in the US military since then have walked in dangerous places and in challenging circumstances. They were given military gear to sustain them but truly the Gideons, following God’s urging, gave them what they really needed to give strength, to give guidance, and to give hope during hazardous operations far from home and family. As a retired military officer, I am thankful for God’s calling to continue the work with the military of today. Keeping them fully equipped to head into dangerous places…armed with God’s word speaking of His Love and His Righteousness. Thanks to all who gave then and to those who give today. It makes a difference in the lives of the military who serve us today and tomorrow. 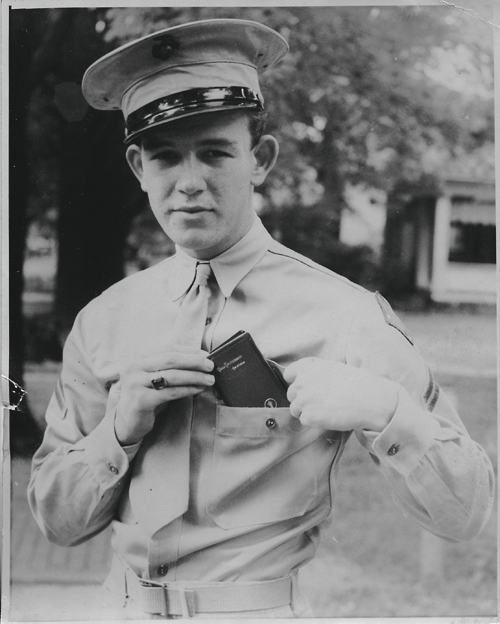 Bob Keeter of Van Buren, entered the service during the Korean Conflict. He carried his service Testament every day. One day he was wounded by enemy fire. He received shrapnel in his abdomen. He was nearly killed . . . The entry penetration is big as my thumb in the front cover of his New Testament. The hole gets progressively smaller as it goes deeper. The Word that was marked where the shrapnel stopped was Plil 3:10 That I may know Him and the power of His ressurection. That Bible saved his life twice! Kept him from instant death and brought him to eternal life! I am in the Ulyssess, KS camp. Praise God for this ministry and all the Bibles that reach all over the world and save souls. Praise the Lord to countries that open their doors to The Gideons International to distribute and share with their military servicemen. My prayer is that Malaysia will one day also open its doors to share the Word of God with their servicemen.